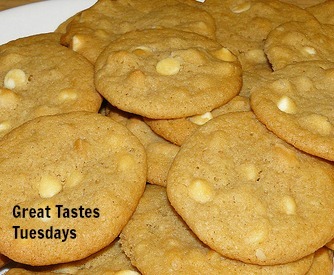 Great Tastes Tuesdays! : Macadamia Nuts! It is Tuesday and I am ready to announce the great taste for the week! I made these the other day and I couldn't get them out of the oven fast enough before my husband was eating almost all of them! Great cookies! The nuts make them even better! In a mixer bowl, beat the butter, sugars and eggs until they are light and fluffy. Add the flour, soda and salt. Mix at low speed until it is all combined. Stir in the vanilla and nuts. Drop by rounded tablespoons onto an ungreased baking sheet. Bake at 325 degrees for 15-18 minutes! These cookies look and sound yummy. New follower, gfc, twitter and pinned it. I also have a link party on Tuesday, please come join in. Thanks for the comment! I will visit you!